The Bellingham Community Garden, which is a collaboration between the Town of Bellingham and the Hockomock Area YMCA, is now accepting registrations for plot rentals. This is a great opportunity to tend your own garden this May through October. Located at 200 Center Street in Bellingham, the community garden provides 10’ x 20’ plots (roughly), water and some gardening tools, and will run workshops throughout the season. Service learning opportunities can also be arranged for those wishing to volunteer in a community setting. 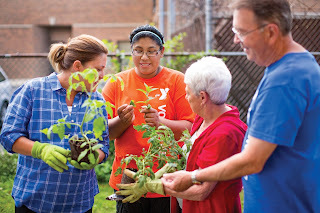 The mission of the Bellingham Community Garden is to promote healthy and active lifestyles by reconnecting individuals to the food they eat and grow. Plot holders can look forward to a season filled with farm-to-table produce, meeting new neighbors and friends, and engaging in different opportunities for learning. The plot rental program is open to all community members and offers a gated garden in which members, provided a lock code, will be able to garden from dawn to dusk. The Hockomock YMCA will also facilitate soil testing through UMass Amherst for plot holders interested in optimizing food production. Interested applicants are asked to fill out a contract, available at www.hockymca.org/garden/, or email communitygarden@hockymca.org to request a contract. Cost for the season is $75 and checks can be made out to Hockomock Area YMCA. You may also stop by the YMCA at 45 Forge Hill Road, Franklin for details and a contract or call 508-528-8708. Be sure to visit the Bellingham Community Garden on facebook: @bellinghamcommunityfarm. Our YMCA is committed to partnering and collaborating with others to create and deliver lasting personal and social change in the 15 communities we are privileged to serve. The Hockomock Area YMCA is a not- for-profit charitable cause-driven organization with facilities in North Attleboro, Foxboro, Franklin, and Mansfield. For more information visit hockymca.org.